The evening’s performance featured a rocking performance by Marie Carne, among the brightest singers of the Russian stage. A stirring performance by the State Chamber Orchestra of Jazz Music named after Oleg Lundstrem had the audience at the Russian Centre of Science and Culture (RCSC) in New Delhi enthralled on September 27. 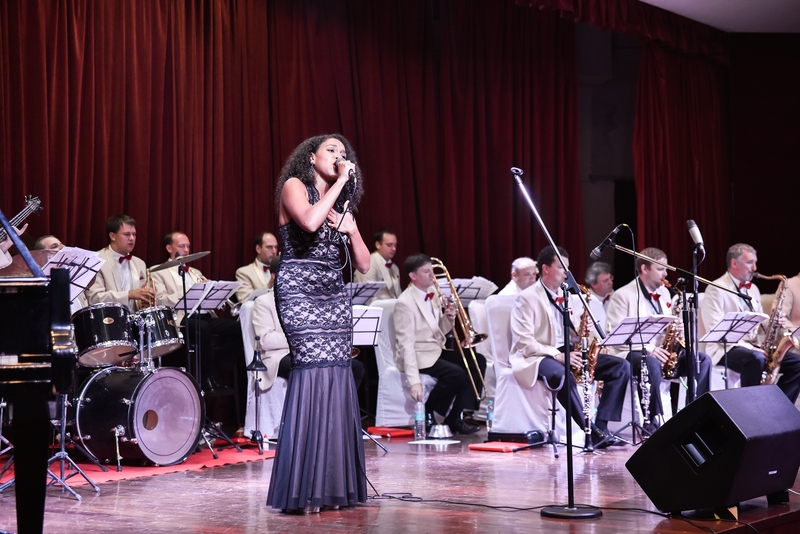 Audiences in Delhi had a unique opportunity to savour a brilliant performance of jazz music at the Russian Centre of Science and Culture (RCSC) on September 27, 2016. The State Chamber Orchestra of Jazz Music, named after Oleg Lundstrem, performed to a packed hall of enthusiastic people. The State Chamber Orchestra of Jazz Music occupies a proud niche in the Guinness Book of World Records as the longest lasting big band in the world. Inaugurating the Festival of Russian Culture in India, by performing concerts in Kolkata and Delhi over the past few days, the band had also taken part in the Inaugural Ceremony of the “Year of Russia in India” in a gala concert at the historical Purana Qila in New Delhi in 2008. The large gathering, which attended the magnificent cultural feast, included members of the diplomatic corps, Russian compatriots, artists, Russian language students, social activists, academics, educationists, teachers, media persons, and others. Alexander M. Kadakin, the Russian Ambassador to India, was chief guest for the jazz evening. Fedor Rozovskiy, Director, RCSC, was also present. The band was led by Boris Frumkin, Artistic Director and Chief Conductor, an Honoured Artist of Russia and a Member of the Russian Union of Composers, who is a distinguished pianist with many laurels to his credit. The evening’s performance featured a rocking performance by Marie Carne, among the brightest singers of the Russian stage. Her stunning, deep and melodious voice, amazing energy, impeccable musical taste and fiery temperament won her much applause and many admirers. Her vocal repertoire included songs by composers of Russian music, classical songs, pop songs, jazz, Latin American music, French chanson and world hits. Having won numerous awards at national and international festivals and competitions, she is the youngest winner of the Silver Order “Service to Art” International Academy of Culture and Art, as well as the Order of “Honorary Citizen of Russia”. Ambassador Kadakin and Rozovskiy felicitated the artists with flowers after the wonderful performance.